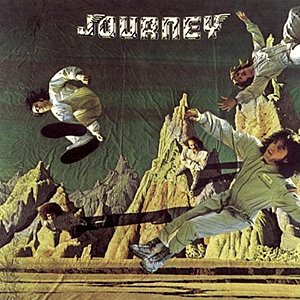 Journey is the self-titled debut album by the band of the same name. It was released in 1975 on Columbia Records with a progressive rock/jazz fusion sound to it. It is the only album to include rhythm guitarist George Tickner among their personnel. This album focuses mainly on the band’s instrumental talents. “Of a Lifetime” starts off the record and you know within the first minute that these boys do not what to be known as former Santana band members, but as musicians that can play and write there own music. While Neal Schon’s subtle guitar riffs are smoothly flowing through the beginning of the song you realize that this is not Steve Perry’s Journey. Then as Greg Rolie starts to sing around the 1:10 mark it is confirmed that no Perry is present. You now slowly start to take in the sound, when Schon does his guitar solo half way through the song your amazement is resoundingly positive now knowing that Journey is much more then a top 40 sound. With two minutes left in the seven minute song Neil and the boys go into the classic rock torrent that blows you away. Neil’s guitar work in those last couple minutes is as real as it can get, you wonder why the group never did anything like this when Perry was around. This entry was posted in Classic Rock, Forgotten Rock Classics, Forgotten Songs, Hard Rock, Journey, Music, Rock Band and tagged Classic Rock, CS5711, Forgotten Rock Classics, Forgotten Songs, Music, Record, Rock Music, Song. Bookmark the permalink. I enjoyed listening to this. Lots of bands were more prog-y in their early days. I know what you mean about “fans” who think they like the band but have no idea of their early work. I feel that way about Chicago. Loved the early stuff before it got all mushy-ballad-heavy-on-the-keyboard sounding. They still rock live, though. Journey did a similar thing, as did Van Halen and Heart, to name a few. I call it the “keyboard curse.” And I do like some of the keyboardy mushy stuff as a stand alone song, but when it dominates the album, well….hmmm. Baron it must be twenty five or six to four? You make some strong points and your group examples really prove the point on ” the keyboard curse”. Thank you much for your comments and we here agree a lot with the all the points you have made. Dave thanks for the great feedback. We here at Forgotten Rock Classics should have mentioned Aynsley in the post. His resume has some of the greatest artists in the world on it. Zappa, Hagar, Bowie and Jeff Beck along with his work with Starship are but a few. And thanks for reminding me of this rock classic last year as I have played it many times since that day. It’s great to see the roots of their musical accomplishments – I can see how the guitar rifts will be developed further and stronger as they mature into their latter incarnation! Great post! Great story Mike. Glad I could bring back the memory of seeing them. I was lucky enough to see them as the opening band to ELP in 1976. Anna thanks for your great feed back. I was reminded of this song about 6 months ago by a friend of mine while we where talking about Journey’s Look into the Future album.Your right about the fact that many people have never heard this song. Wow! It’s been a long time since I’ve seen this album cover. I have only heard this song once before. I am a big Journey fan. I do remember that this is before Steve Perry joined the band. I can definitely hear Neil Schon’s guitar style in the song. Great you liked the playback of the song. I was privileged enough to have seen them perform this song live many moons ago. Having never heard of them before that night this song was the one that stood out the most for me. I hope that by hearing this it brings back happy memories for you.